Welcome to Trailhead Youth Ranch! There’s something special about going out into the country to a real ranch. A place that’s there especially for you, a place where no one’s crowding you and you can just be yourself. A quiet place where the baggage disappears and God seems closer. A place with a purpose, a place where you’re welcome. 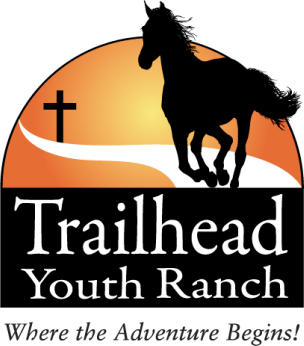 Trailhead Youth Ranch is a non-profit ministry that provides the ideal location, volunteer staff and program to make this a reality for kids and families at no cost. We provide individualized horse lessons, group lessons and off-site adventures. Participants learn horse safety, correct riding technique and how to care for horses. They get involved in the whole process from catching the horse to shoveling the poop. They learn to be in charge and take responsibility. "Trailhead Youth Ranch has changed my life forever. I went from not knowing how to ride, to becoming a great rider. The friends I've made here are the greatest I've ever met, and I wouldn't change it for the world. I've also gotten closer to God and deeper into my faith. Thank you, Trailhead, for everything you've done." These are the forms you will need to fill out before visiting the ranch. If you will be attending a regular session, please fill out the full liability release. If you are attending a one day event, you can use the One Day form instead. Trailhead Youth Ranch is now located on Shady Lane in Anderson, CA. Come visit us at our new location!